Pretty exciting to see all the new ways to advertise! One day soon, you will be able to type in "black shoes" at the mall and your phone will tell you which stores, racks, and what is on sale. It will even give you directions if you need it. Two years ago, I thought that idea was the spookiest thing ever. But after throwing it out to classes, shoppers were ready to opt-in. It would take me almost the entire concert just to get my text entered into the phone. I have heard that the Obama presidency is partially a product of this as well. Makes me think that I should be considering mobile web viewing when thinking website. As a lover of shoes, I would love for my phone to give me current information about the location and sale of such items. It definitely beats running around in hopes of finding what you are looking for. It's bargain shopping for the professional woman (no time wasted)! While I don't expect the phone will replace desktops, they will certainly be how we stay connected. 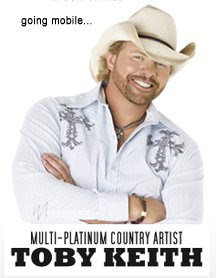 Several companies (including Toby Keith) have Web sites dedicated to phone viewing, specifically. I played an online text-based Web game on my phone for awhile, but then it became too complicated to keep up. :) It would have been a hit if they kept it simple. I suspect shoe shopping will become so efficient, one day we'll long for browsing. :) Have you tired Zappos? I haven't, but they've certainly helped make show lovers happy! Looks like mobile works for Adidas. (Hat tip John Sumser).